We were considering our options Monday morning when the VHF radio crackled to life. 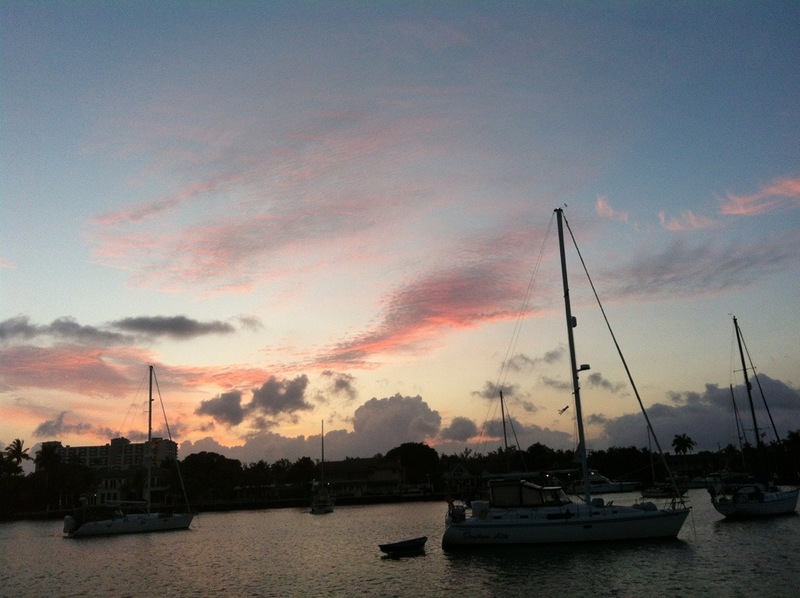 Jack answered the call and it was a sailboat coming into Port Everglades from the ocean wanting to know if there was room to anchor in Lake Sylvia. It took us a minute to realize we had turned on all our instruments in preparation to leave and the AIS was broadcasting our name and position. I set the AIS to silent mode after that, meaning it receives data about other ships but doesn’t transmit ours, which we certainly don’t need to do when we’re sitting in the middle of a lake. We know from our limited experience that dozens of boats at the docks with AIS on just clutters up the screen. Nonetheless Jack was happy to reassure Ariel there was plenty of room for them in the Lake. Since we couldn’t make up our minds about leaving we tore into the watermaker and changed the membrane. It was a fairly easy job made difficult only by having to work in tight places where each turn of the wrench skins your knuckles against the hull. The day before, Easter morning, we were greeted not only by a cruisers version of an Easter parade but also by a dead fish floating past our stern. Sara on Tumbleweed blogged last year that you know it’s time to go when the dead pig floats by and we wonder if the fish isn’t some kind of Schulz addendum to the Tumbleweed Rule. Still, we ignored the sign and succumbed to the anchor glue that gets us everywhere we go. As we were waiting for the purge cycle to finish we got the kick in the pants we needed from an old friend living in St. Thomas. Today would have been a good day to get across the GS before the wind goes N of E but it is what it is. I would even leave before sunset if it was up to me but I know you guys probably don’t want to cross in the dark. Wait, what?! We love night sailing! That’s all it took. 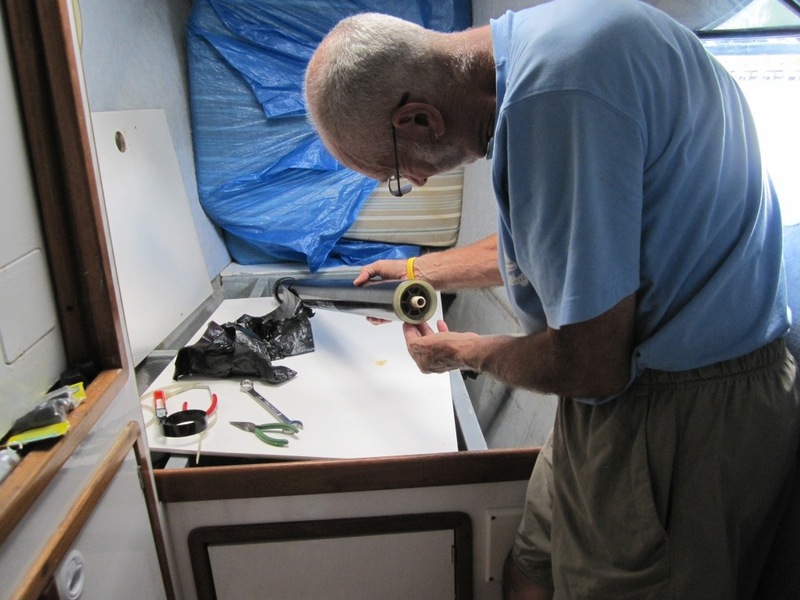 We knew there wouldn’t be another window for crossing any time soon, so we buttoned up the watermaker and headed for the fuel dock to top up our tank and fill our backup diesel cans. We made the 6pm bridge opening and bucked a wacky current for a couple of hours to get to the gulfstream. For those unfamiliar, the gulfstream is a strong warm current that flows from south Florida along the southeast coast, then angles across the Atlantic and is the reason England, for example, isn’t a frozen wasteland given its high latitude. In south Florida the gulfstream is only 7-10 miles offshore and can be 40 miles wide. It’s fast and depending on the weather conditions crossing it can vary from slightly bouncy to downright terrifying, like maybe stepping onto a moving roller coaster. Sailors give the stream a lot of respect, and newbies are understandably tentative. We crossed the stream only twice before, during the 2000 Bermuda Ocean Race from Annapolis, both going and coming back. Going I remember a 12-hour hurl fest that kept the rest of the crew hiding inside while I lay prone in the tiny cockpit with my head hanging so far over the side that the waves lapped at my hair, carrying away breakfast, lunch and dinner. My watchmate handed over a damp paper towel every time I came up for air. Monday night the conditions were so perfect that we barely knew we’d entered the stream and experienced only the least little bit of rollicking without the raucous that can come with it. 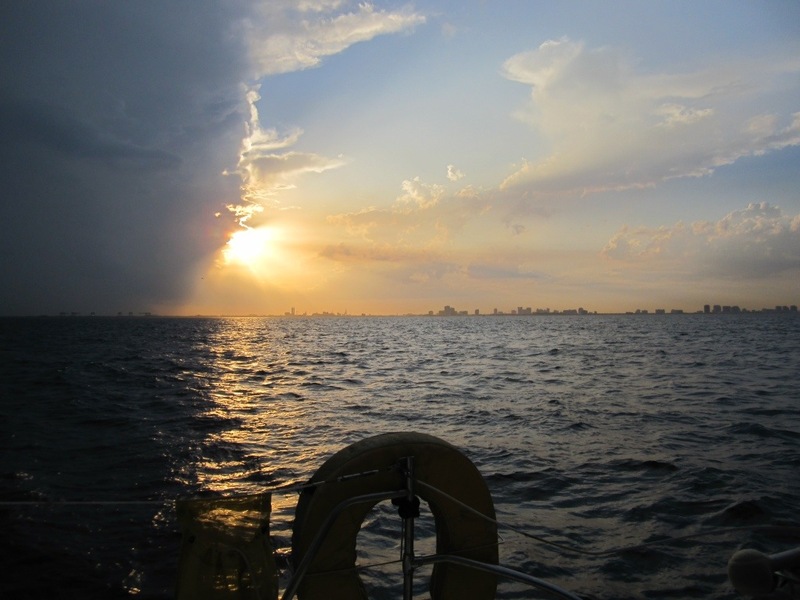 By morning we had passed Bimini and even though the wind left us we decided to continue on motorsailing for another day to get as far as we can before unfavorable weather moves in and the anchor glue gets us again. So no joy on the SSB. No fix on the leaky toilet. Whatever. We have a portable radio for weather and another toilet. 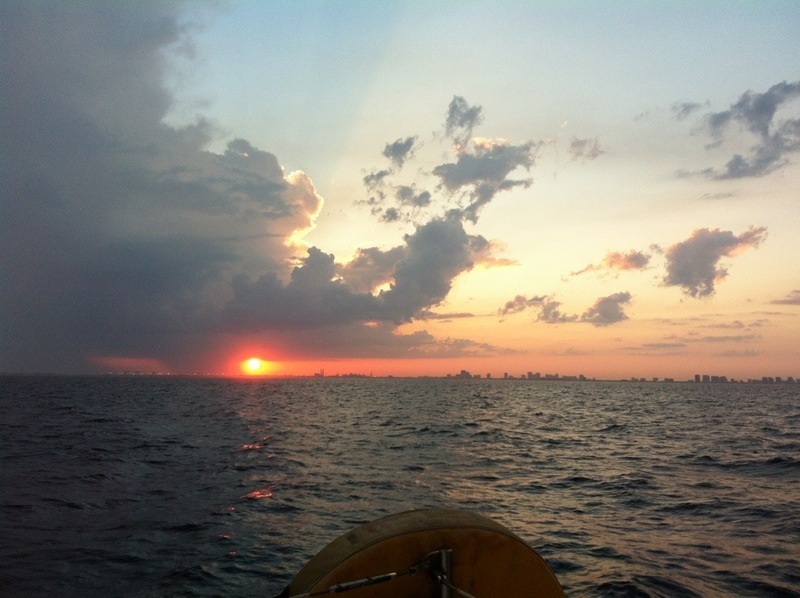 We decided to leave early Monday morning after the Gulfstream weather report and point our bows toward the Bahamas. I was up at 6am to have plenty of time to tune in the weather. Time, yes. Clear signal, no. What is it with this place? Or am I just a total radio idiot?? I finally got a passable signal by standing in the cockpit and pointing the radio in a specific direction. It didn’t sound great for a gulfstream crossing but after today it gets worse. And doesn’t get better for a week. Rats. We checked into the other weather sources and hemmed and hawed and finally decided to go. Only one boat had left the anchorage. We did our pre departure checklist which includes turning on the sailing instruments and discovered another gear failure. Out on deck the wind seemed to be about 15 kts. Our instrument said 0.0. Oh no! Not again! 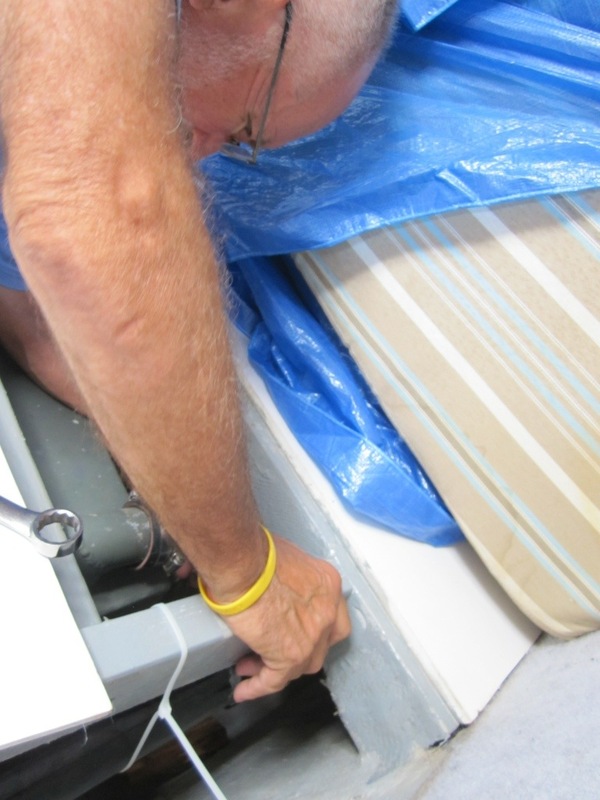 We lifted the sofa cushions to reveal the wires connecting the masthead unit to the instrument screen at the helm. Jack checked and blessed them with his magic electrical potion and lo and behold we had a readout. Of 1.2 kts. Absolutely not correct. This is the third or fourth time this has happened so we’re definitely looking at a total failure before long. And normally it wouldn’t be too much of an issue except that we’re planning a gulfstream crossing and we’d like to know the wind speed, for heaven’s sake. Finally — and why do I even use the word? — we have developed a significant leak in the watermaker. It used to be a little leak, now it’s bigger. At the same time our water production has dropped. The water quality is great; it just takes a very long time to fill the tank. By this time, actually after we noticed the wind instrument had failed, we decided today was not our day for the Bahamas. Jack called the local watermaker guru who spent the better part of an hour on the phone with me troubleshooting our low production and the leak. He recommended we change the membrane because we have no idea how long this one’s been in service and there was nothing else in the system he could pinpoint that would affect our output. So today, instead of a beautiful sail to the Bahamas, I will be hanging upside down in the garage replacing a watermaker membrane. Luckily I had the foresight to order a replacement last summer. Mr. Guru will bring us a backup pump head and a replacement valve for the leaky one, and may even step in with the membrane installation if I get into trouble. They say cruising is fixing your boat in exotic places. I don’t mind the fixing, but I sure wish we were in a more exotic place!